60Patrol • View topic - 1967 Softop Project "Robin"
The floors you get will need to be modified somewhat. The seat bench is bolted on to the tub. I have seen threads on how the floor pans were modified, do you know of the tubs need modification? I'm not sure? I can't think of any differences in the mounting of the tubs. One concern would be the door jamb where the door latch mounts, the latched were different after '67. If the inset on the jamb is the same it should work. So I was out in Las Vegas for work and decided to cancel my flight, book a rental truck, and pick up some patrol parts from Plateaucal in CO. The most important piece was the frame, which has no rot! Kyle, another member was lucky enough to claim a tub, bulkhead, and some other parts I was unaware of. Regardless, I helped deliver them to him in OH on the way home in return for some gas money. Man I wanted that tub! The doors, hood, transmission cover, and some smaller parts came home with me. Overall, I am super happy about the frame. It should speed up my process quite a bit. I plan to reweld on one tab that was cut off, open up the crossmember to address any hidden rust, and then have the whole frame galvanized. Has anyone seen a galvanized patrol chasis? I told you they were some of the best parts on the globe awaiting a new home. Very nice score! Thanks for helping out Kyle get his parts and a big thank you to Plateaucal for spreading the love. I would strongly caution against the Troa tub. I bought about 3k worth of their parts and they are Very hit and miss with respect to the quality and fit. The floors are fine to modify and the fenders are close enough to work with, but I doubt the tub will be able to be fixed without a ton of work. 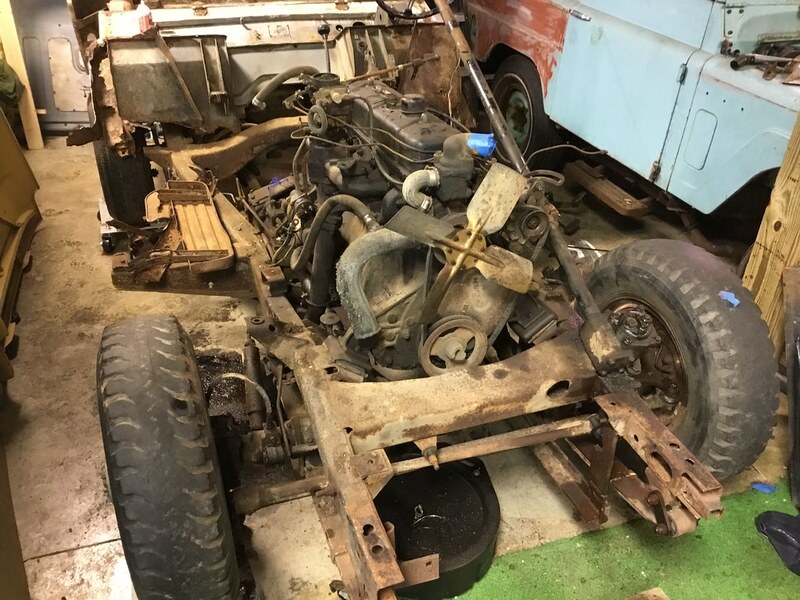 I am in the process of repairing the '72`s tub. It is not that hard to get a mig welder and cut pieces that will fix your issues. I can post pictures and repairs that are common to the tubs. L60Boerne wrote: I told you they were some of the best parts on the globe awaiting a new home. Ordering new alcan springs on Monday. Helping a buddy strip down his landcruiser so we can have both frames hot dip galvanized. I guess the axles are the next logical approach so I can have a rolling frame put together. Is it new to replace everything in regards to axle seals or just leave it until I need to? I could just pop the diff cover, make sure it’s clean, do additional cleaning, fill with fluid, and clean them up / repaint. I would replace the wheel bearings and seals. That means pulling the axles out but not the diff. Have a look at the diff and clean the housing out as best you can. You may need a new diff gasket as well. There are wheel bearing kits available on ebay. Ordering new alcan springs on Monday. Out of curiosity how much are they getting for springs now? And shipping? I am told these springs are more expensive as they are tapered towards the ends and need to be ground down, so there are more labor hours? Got the parts truck down to a rolling chasis. Heading back to the shop tonight to start removing shocks, swaybars, driveshafts, etc. Basically everything I can before the motors ready to plucked. Spent a few hours at the shop last night. Are the tie rod ends on eBay compatible? *** I am told no because they are metric threads vs the standard we need. Sounds like I will be rebuilding the ones on the patrol. Do we have a source for U joints? Today I ordered some goodies. Basically all the bushings and suspension pieces I could think of like bushings, boots, shocks, to get the suspension squared away once the springs are in and the frame is back from being galvanized. These will serve as body mounts. I need to order some sway bar end links from Energy Suspension too. I need to measure the ones that came off the patrol to decide which ones to get unless somebody has a recommendation for a 2" lift. Just a heads up, you may need square steel pieces with holes in them to properly distribute the load on the pad. The orginal ones appear to be a rubber pad sandwhiched between two pieces of steel. I used 1/8" thick steel with the energy suspension mounts, but I think I am getting about a 1/4" of body lift out of the setup. For the bump stops, you will need a way to mount that bump stop. On my thread is some pictures of how I took the plate that used to have bump stops glued to them and what I did to get a bump stop back onto the pad without trying to glue one on there. It was 'Energy Suspension 9.9103G SM. GEN PURPOSE BUMP STOPS' with the original backer pad and two large washers. There are pics on my thread that may inspire you to figure out how to mount yours. I am excited that you are about to go in the forward direction with a Patrol (pieces on not off)! Keep up the great work.